Ready for a Weekend Warrior Initiative? 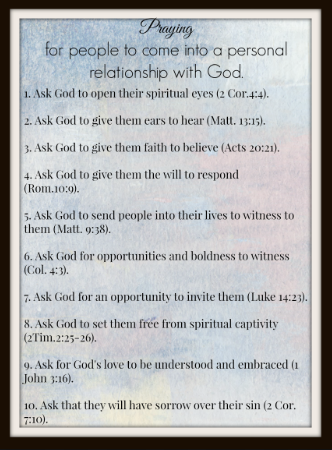 Let’s spend 5-10 minutes praying for friends and family members who need to enter into a relationship with Jesus Christ. Hey, we could get crazy here and spend 30 minutes in prayer for those we know who are far from God! Pray because it will change their hearts and their ability to hear God speaking. Also, praying will charge our readiness to take each opportunity that comes to share about our own relationship with Jesus. Want to build your faith? Pray! Pray especially this weekend for lost people, and when they turn their hearts toward the Lord, you will rejoice knowing that God answered your prayers! I pass along to you this helpful guideline that my pastor gave to me. ← Perfect love empowers us with perfect confidence.